Fall is here! The air is turning crisp and cool! The best part of the season for me? Turning the fireplace on! I just LOVE roasting myself in front of the fire! So many exclamation points, I guess I’m a bit excited. Today what I’m most excited about it is a fall pumpkin faux floral wreath I made for my front door. I learned quite a bit working on my spring wreath so I tried to make this wreath easier AND cheaper. I LOVED how my spring wreath turned out, but it was expensive and time consuming. The lamb’s ear was so beautiful with awesome texture but pricey. I think I paid $6/stem and bought 5 stems. $30 just in greenery! That wreath ended up somewhere around $60 total. Not horrific when you compare to Etsy prices, but more than I’d like to spend on a seasonal decor item. Then the time…wrapping each section in floral wire, winding it around the wreath then hot gluing took forever! It took me multiple afternoons to make that one wreath. It turned out beautiful, so I don’t regret the time spent. However, this time, I wanted to finish in under 2 hours. My kids are in “quite time” from 2-4 and I was hoping to be mostly if not all the way finished by then. 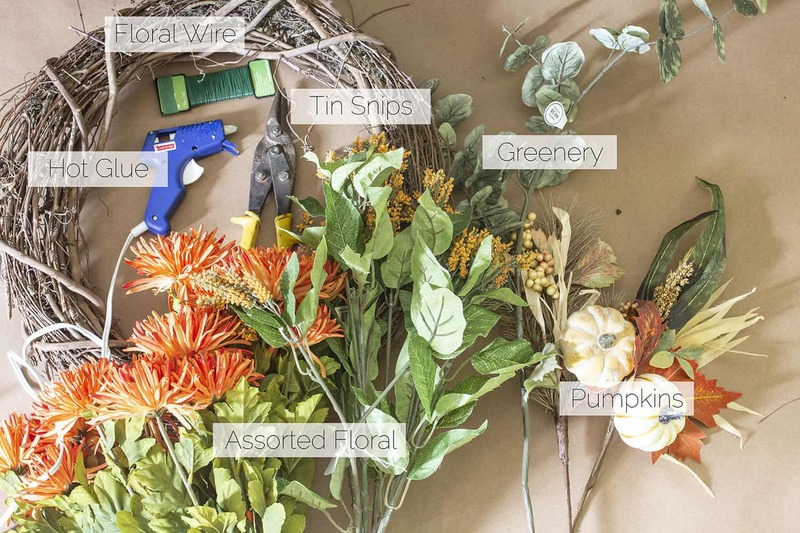 I’ve learned a few tips about buying faux flowers and greenery that I need to share. Buy flowers and/or greenery at your local thrift shop. There’s one thrift shop in my town (maybe all do this??) that regularly has brand new faux floral stems for sale for a fraction of the price at the store. Faux flowers are pricey and add up quick! I was able to grab both types of orange flowers used in my wreath for $7 total at my local thrift store. The best part? I didn’t even use all that I bought. There’s enough for another project or to spice up another area in the house! Shop sales at local hobby stores. This likely means you have to make your craft in season as sales are unlikely to be ahead of the season. But who plans ahead anyway? For this wreath, all fall decor items were 40% off in the store which was a huge savings. Hot glue all the way, baby. I only used the floral wire to attach some ribbons which I’ll share at the end. For all of the rest of the pieces, I put a generous amount of glue on the end of each stem then shoved it into the grapevine wreath. Wait a few seconds between each piece to give the glue time to set then add additional glue if it seems like a piece is still wiggling a bit. I neglected to take pictures as I went because this goes SO FAST. When you don’t have to wire, wrap, and glue every single piece, this project actually comes together very quickly. To give you an idea of my process, I’ll outline my methods below. So sorry for the lack of pictures! First, I used a rubber band to mark the top of my wreath then I attached the pumpkin to the wreath directly opposite the rubber band. Beginning in this way will help the wreath stay symmetrical. Next, I wanted to mark my end points. So I snipped two pieces of greenery and glued them equal distant from the pumpkin, marking the left and right end of the arrangement. Now, fill in each side. I didn’t follow any set pattern but just evenly interspersed greenery, berries, and flowers from the ending greenery back toward the pumpkin. When I got close to the pumpkin, I had room for the flanking orange flowers. I attached those and liked how it looked so then I added the orange flower in front of the pumpkin and filled in with greenery between the orange blooms. If I was unsure where to put a bloom or stem, I would push one or two into place without glue and hold the wreath up as if it were hanging to see if I liked it. Then I would take out the pieces and glue them back in. This way you can give it a trial run before committing with hot glue! Break up the arrangement by adding ribbon, bows, poufs, or anything you like! 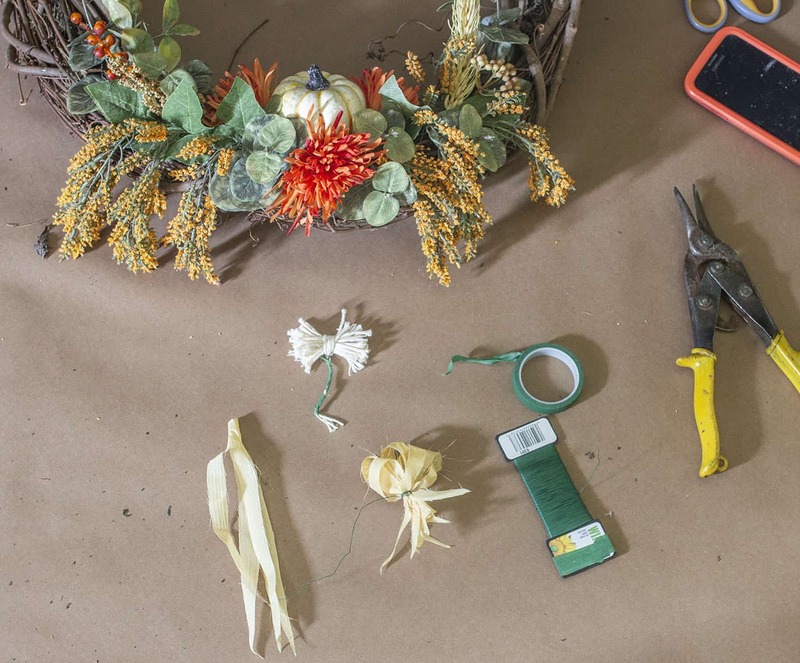 I took some pieces of cloth that came in my pre-made pumpkin arrangement, folded them in half and wrapped the end in floral wire. Glue the wire to the wreath then pull the ribbons apart for a cute ribbon ball. Continue to add floral, greenery, or non-floral items until all the gaps are filled and you are satisfied with your wreath. Hang that puppy on the door and call it a day! I love seeing the pops of orange on my door! West Michigan is all kinds of rainy and dreary these days so bright autumn colors are a welcome sight. Soon the trees in my yard will match the flowers on my door! 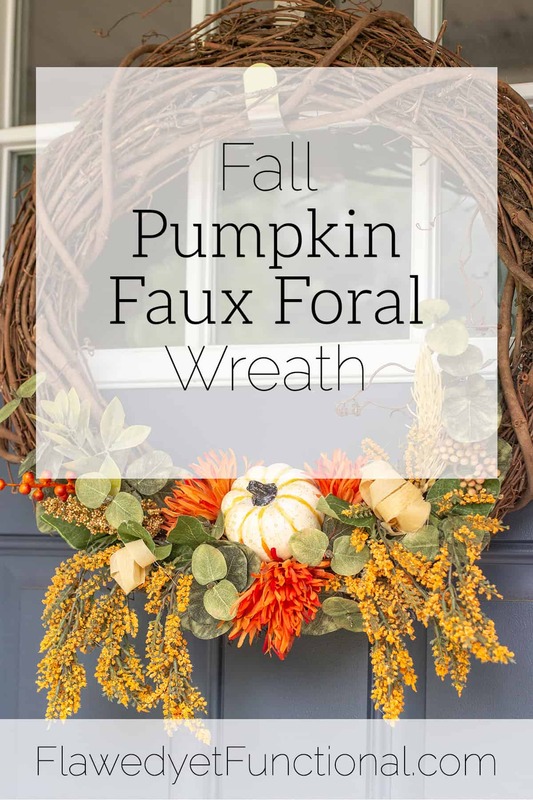 Give this fall pumpkin faux floral wreath a whirl! 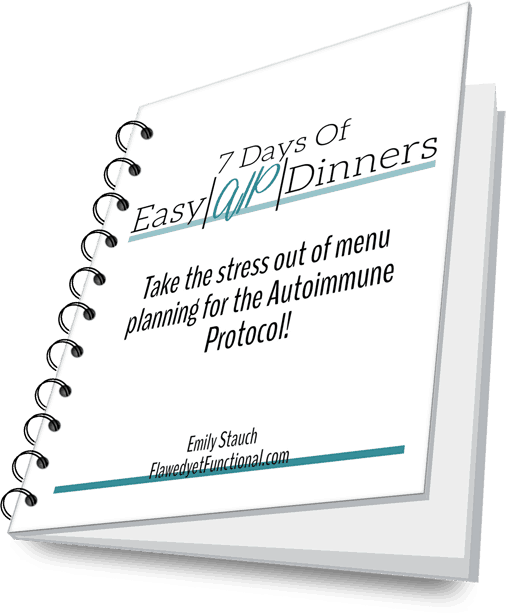 It’s so easy anyone can do it. All you need is hot glue and a bit of determination. Oh and don’t give up at first, it always looks terribly scraggly when you start, but it will come together, I promise! Welcome, fall! So glad you’re here! 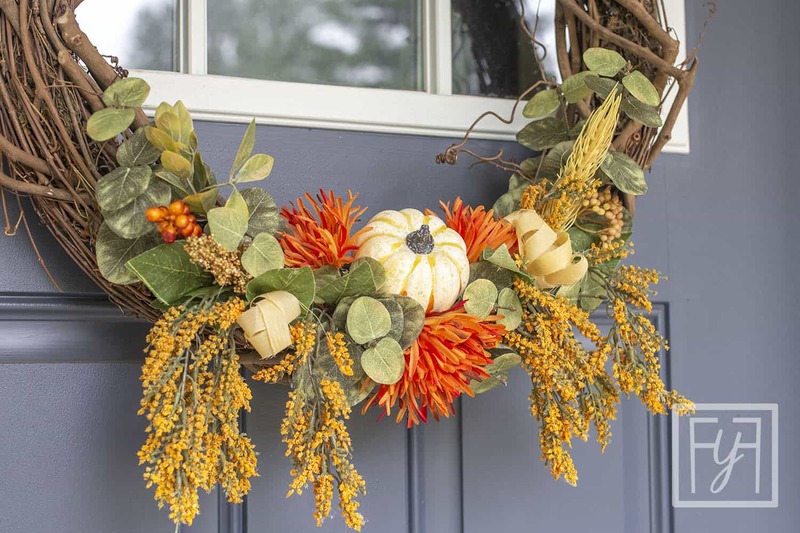 Do you decorate your front door or porch for autumn? What are your go-to decorations? Pumpkins? Mums? Scary Halloween decor?